If This Then That is a unique web service that provides you with options to combine different services and websites with each other. This is done via so-called recipes which contain a trigger and an action. This can be the automatic saving of Gmail attachments on Google Drive, a notification when it will rain the next day, or the automatic sharing of favorite YouTube videos on Facebook. The service supports 98 channels in total including Facebook, Email or Weather. Each channel has its unique triggers and actions that can run automated tasks for you. 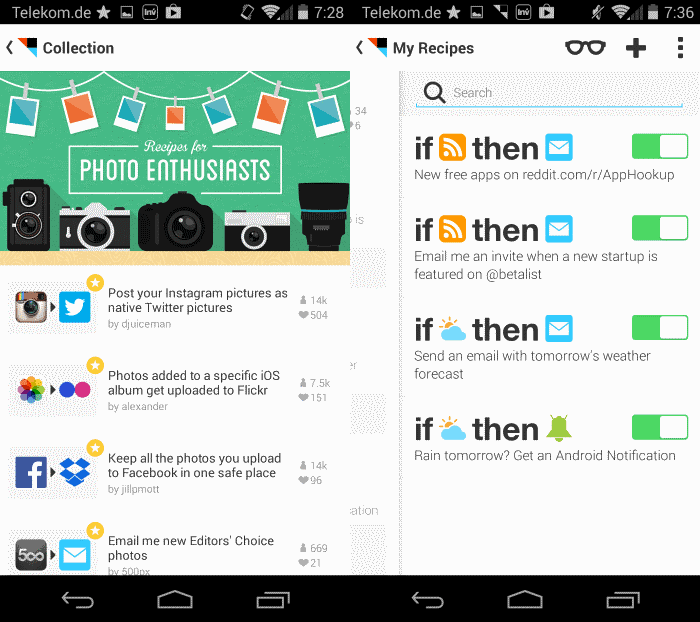 The IFTTT Android application has been released yesterday. It is compatible with all Android versions 4.0 and up, and can be used with the same account. The app offers the means to create a new account in case you do not have one yet. Once you have signed in, you can browse recipes shared by others, create your own recipes from scratch, or manage existing recipes right from within the app. The browse option displays collections, featured, trending and all time recipes in the interface, and offers a search option to find individual recipes faster. Collections are groups of themed recipes, for instance for nature lovers, basketball fans, surfing the Internet or photo enthusiasts. The difference to channels is that a collection may list recipes for multiple channels, while a channel only those that it is included in. Channels need to be activated before they become available. To activate the weather channel, you need to add a location to it. Other channels may require authorization before they become available though. Once you have enabled a recipe, either directly with a tap on the use recipe button or after entering required data or authorizing its use, it is automatically enabled. All active recipes are displayed on the my recipes page. Here you can quickly disable them with with a tap on the green icon next to them, or enable them again if they have been disabled previously. The app provides you with options to create your own custom recipes as well. Start by selecting a trigger from the available ones. It is for instance possible to select a date & time trigger to run something every day or hour, a trigger when a new photo is created, when a phone call is placed, or when the device connects to a specific wireless network. Once you have defined the trigger, you need to define the desired action as well. You can have the app send you an email for example when the event occurs, create a status message on Facebook, submit a new text post on Reddit, or send an SMS. The app has a few issues right now. Some channels, like the Pushbullet channel, don't seem to work properly right now, and some features seem to have been ported directly from the iOS application. You may notice references to iOS specific features, such as iOS notifications, but it is likely that those will get sorted out in the long run. 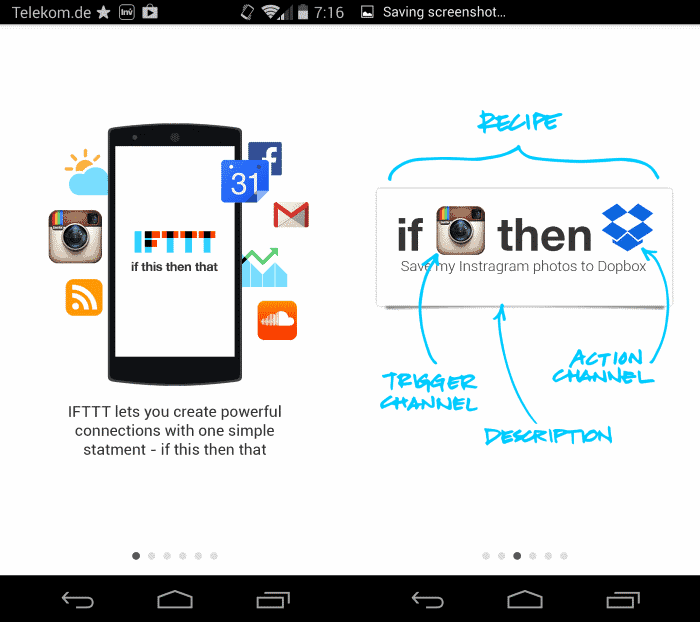 If you are using IFTTT and Android, then you can use the app to manage your recipes on the mobile device. Help! You say “The app offers the means to create a new account in case you do not have one yet.” but I do have an account and can’t find nowhere to login with my existing username and password instead of signing up again! EDIT: found it. Maybe it’s because my screen is little, but you have to touch the gray underline (maybe the top part of a hidden button for some design flaw) that converts the form to a login one instead of sign up.